Rocking out in Tokyo for Autism. Photo by the author. World autism day rolled by yesterday. 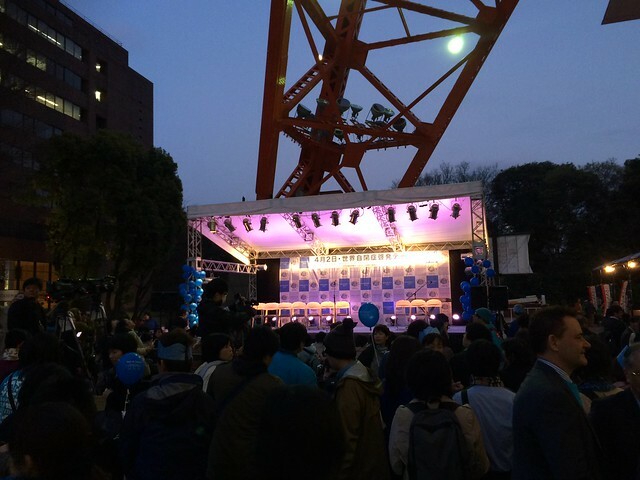 I had the privilege of seeing the celebrations both on Twitter but also chanced upon a live event underneath Tokyo tower last night. For some parents it is a day to both celebrate their amazing kids but I suspect one tinged with a bit of sadness. Each parent of a child on the spectrum I’ve met has been phenomenal. They are amongst the most kind, caring, patient and generous people I’ve ever met. Russell’s post touched on something that has niggling away in my mind for the last few months. The parents of the autistic kids I’ve encountered are largely educated and middle class. Yet I doubt autism only presents in the educated and well-off parts of our community. What happens to the kids on the spectrum who come from marginalised communities? What happens to the kids whose parents don’t have the capital both financial and cultural to do battle with the system to get the support? I’m wondering how many of the kids get suspended, expelled, ejected from the public education system. How many kids with ASD are written off by the education system as bad kids? Because getting the support is hard. I suggest you read Autism and Oughtisms account of her experience of public schooling for her sons. Don’t worry. I’ll still be here ranting when you are done. I know Autism and her husband from university days. Both of them are fiercely intelligent and hard working with multiple university degrees under their belts. If anyone could make things work, it should be them. What comes across in her posts is what a struggle it is for her to ensure her sons have access to education. Yet I also see the other perspective. I teach students with autism. I’ve inadvertently triggered many a meltdown with something I’ve said or done. But I’ve also had occasions where some quick thinking and deft management has kept everyone on track, including me. It goes without saying that sometimes I find some of the behaviour challenging. Before our crazy assembly I went and problem solved any potential triggers for a student with autism in another class. The plan called for disrupting routines, there would be a lot of noise and energy which could be a recipe for a tough morning. The teacher sounded relieved when the conversation was over ‘oh phew you get it’ she gasped. We worked out a plan together and the child had a great time. When I find myself wanting to blame the kids, I know it is time to take that step back for a few minutes and regroup. And in my situation it is so much easier to do that. Teaching at an international school, there’s a classroom assistant, some kids have assistants attached to them and the class sizes are low (less than 20 for this class). When I need timeout, there’s people there to help manage the situation. The school and the parent community ensures that I have the ability to meet the learning needs of both the autistic kids and the other kids in the class. But it’s still a hard job. Do I think I could cope if I was teaching those same kids in the conditions at a public school in New Zealand? Not well and do right by the other kids in the class. But like most New Zealand educators, I’d make the situation work as best I could for the kids. And that’s where I think the problem is. There’s only so far teachers and schools can stretch the meagre resources in the public sector. Most teachers want our classrooms to be fun and engaging places for all the children we teach. Despite the challenges, the kids with autism I’ve taught always get me thinking in new and creative ways about the units we study. They are incredibly rewarding to teach but they can be tough. And that can grind down on you if there aren’t others out there who have got your back. i don’t doubt there’s some crummy attitudes in the education sector who are making it unnecessarily hard for kids with autism. Moreover I’m sure there are some schools that are far more welcoming and will scrounge money out of places to give teachers and kids support. But I also know that no educator gets into the business of teaching to make kids hate school. Without a strong culture of collaboration, both in the school and the wider community, teachers go into a survival mode which is not the place to teach kids with ASD. Yet it doesn’t have to be this hard. Along with acceptance and donning bright colours on autism awareness day, I also feel teachers have a responsibility to be advocates. To speak up about the dire state of special education funding especially for the kids on the edges of our society. But perhaps most importantly, we need to acknowledge how amazing the parents of the children are in all that they do for their kids. Your children wouldn’t be so awesome if weren’t for the patience, love and advocacy you give everyday. I resisted the urge to give the parents under Tokyo Tower a big hug. But you all deserve one.